As soon as he got home, he went to the larder; and he stood on a chair, and took down a very large jar of honey from the top shelf. It had HUNNY written on it, but, just to make sure, he took off the paper cover and looked at it, and it looked just like honey. "But you never can tell," said Pooh. "I remember my uncle saying once that he had seen cheese just this colour." So he put his tongue in, and took a large lick. "Yes," he said, "it is. No doubt about that. And honey, I should say, right down to the bottom of the jar. Unless, of course," he said, "somebody put cheese in at the bottom just for a joke. Perhaps I had better go a little further...just in case...because Heffalumps don't like cheese...same as me...Ah!" And he gave a deep sigh. "I was right. It is honey right the way down." 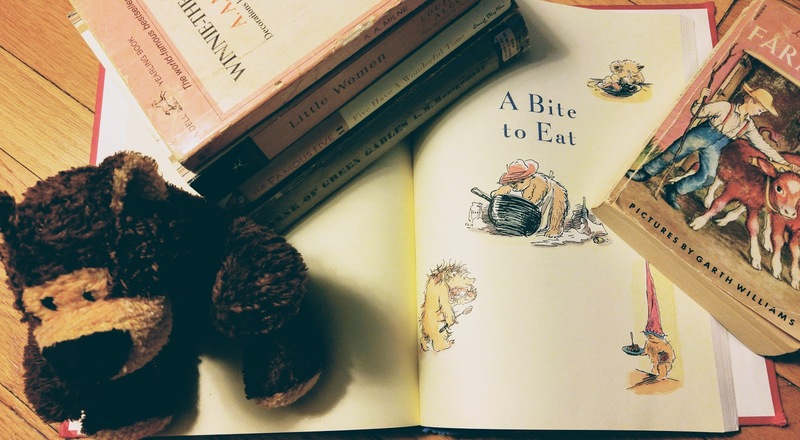 Children's books make me hungry. Winnie-the-Pooh is a perfect example. Read a chapter of two and you will be dreaming of honey too. Maybe some buttermilk biscuits hot from the oven, split open with butter dripping down the sides, and lots and lots of honey. Pooh always thinks it is time for a little something and eventually you find yourself feeling the same. The Famous Five seem to spend all their time eating and their cooking is frequently done over a campfire which only makes it more appealing. truly wizard lunch--two hard-boiled eggs each, fresh lettuce, tomatoes, mustard and cress, and potatoes baked in the fire in their jackets--followed by what Julian had asked for--slices of tinned pineapple, very sweet and juicy. And so it goes, ice cream and ginger beer and fizzy lemonade and picnic after picnic. Not only are they gloriously free from all parental supervision but they live a life of one adventure and one meal right after the other. eating apples and crying over the "Heir of Redcliffe," wrapped up in a comforter on an old three-legged sofa by the sunny window. This was Jo's favorite refuge, and here she loved to retire with half a dozen russets and a nice book, to enjoy the quiet and the society of a pet rat who lived near by, and didn't mind her a particle. And of course, Amy March and her downfall brought about by her love of pickled limes. I still have a burning desire to try a pickled lime. There is also Anne Shirley and her downfall. Brought about, of course, by her confusing currant wine for raspberry cordial and getting Diana Barry drunk. I love her monologue on cake baking that she was in the midst of when she realized Diana was sick. I should think Marilla's raspberry cordial would prob'ly be much nicer than Mrs Lynde's," said Anne loyally. "Marilla is a famous cook. She is trying to teach me to cook but I assure you, Diana, it is uphill work. There's so little scope for imagination in cookery. You just have to go by the rules. The last time I made a cake I forgot to put the flour in. I was thinking the loveliest story about you and me, Diana. I thought you were desperately ill with smallpox and everybody deserted you, but I went boldly to your bedside and nursed you back to life; and then I took the smallpox and died and I was buried under those poplar trees in the graveyard and you planted a rosebush by my grave and watered it with your tears; and you never, never forgot the friend of your youth who sacrificed her life for you. Oh, it was such a pathetic tale, Diana. The tears just rained down over my cheeks while I mixed the cake. But I forgot the flour and the cake was a dismal failure. Flour is so essential to cakes, you know. Then there is Paddington Bear. We are introduced to him when he has tea with Mr Brown. Before Mr Brown could answer, he had climbed up and placed his right paw firmly on the bun. It was a very large bun, the biggest and stickiest Mr. Brown had been able to find, and in a matter of moments most of the inside found its way onto Paddington's whiskers. People started to nudge each other and began staring in their direction. Mr. Brown wished he had chosen a plain, ordinary bun, but he wasn't very experienced in the ways of bears. He stirred his tea and looked out the window, pretending he had tea with a bear on Paddington Station every day of his life. Paddington goes on to eat hot cocoa and chocolate cake and have picnics on the river and, of course, eat countless marmalade sandwiches--many of which are stored in his hat in case of emergency. When I was small and first reading the Paddington books I wasn't completely sure what marmalade was. I decided it was a cross between honey, jam, and toffee. I love the real marmalade now but I still have a yearning to eventually find my imaginary marmalade. I am sure it would be delicious-- and very sticky. The Little House books by Laura Ingalls Wilder are some of my childhood favorites and they are full of descriptions of food. The first ones that come to mind are the meals Almanzo Wilder eats in Farmer Boy. At last he and Father got places at the long table in the dining-room. Everyone was merry, talking and laughing, but Almanzo simply ate. He ate ham and chicken and turkey, and dressing and cranberry jelly; he ate potatoes and gravy, succotash, baked beans and boiled beans and onions, and white bread and rye'n'injun bread, and sweet pickles and jam and preserves. Then he drew a long breath and he ate pie. When he began to eat pie, he wished he had eaten nothing else. He ate a piece of pumpkin pie and a piece of custard pie, and he ate almost a piece of vinegar pie. He tried a piece of mince pie but he couldn't finish it. He just couldn't do it. There were berry pies and cream pies and vinegar pies and raisin pies, but he could not eat any more. Don't you want a piece of pie now? And to be able to eat like a growing boy? I think I need to go bake. Maybe some pie? I'm sure you must know about Jane Brocket's Cherry Cake & Ginger Beer but in case you don't, do check it out--you'll enjoy it, I think! I have never heard of it but I got two recommendations for it so I will have to look for a copy. All they do is eat! I also want honey every time that I read or see Winnie the Poo. I hope you had a good, honey-filled snack. I remember the boiling of maple sugar, then drizzling it onto the snow in both the Little House books and Understood Betsy. And pulled taffy, although I can't remember which books specifically mentioned that. It always sounded glorious. And then there's the Turkish delight the White Witch tempts Edmund with. I guess the ones I remember are the ones that were unfamiliar and unobtainable! Oh yes! I always wanted to try the maple syrup on snow. I actually had wanted to include pulled taffy in my list but for the life of me I cannot pin down the book memory. I have a scene in my head of a group of children (?) making taffy in an old-fashioned kitchen but I can't locate it. It is nagging at me. Oh well, it will probably come to me at 2:00 a.m. one day.